Abbott and Costello. The Marx Brothers. Penn and Teller. 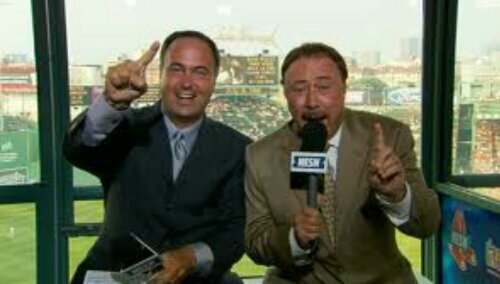 There is no doubt in my mind that Don Orsillo and Jerry Remy are America’s newest comedy dream team. 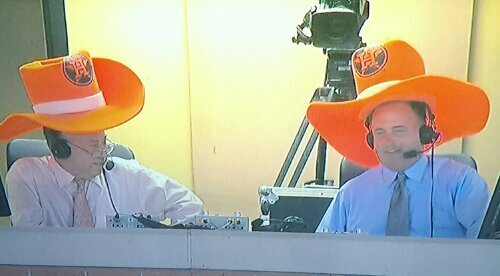 Not only are they the best broadcast team in baseball, but they are also the most entertaining. Last night during the Red Sox/Astro’s game, Don and Jerry donned foam cowboy hats to try and spark a Red Sox rally. While the hats were long gone in the top of the 9th, I have a funny feeling that they helped Stephen Drew hit that game winning home run. Whether they’re wearing funny hats, discussing each other’s chest hair or catching fans in a touchy feely moment like the video above, they make watching a baseball game fun. P.S. How bout them Red Sox! Love that dirty water. Posted on August 8, 2013, in Average Blog Posts and tagged announcing, astros, baseball, Boston, don orsillo, hat, houston, jerry remy, MLB, Red Sox, video, youtube. Bookmark the permalink. Leave a comment.